It’s one thing to start the Indianapolis 500 with a crash near the back of the field. It’s another thing to have another crash under yellow further delay green laps of racing. Oops. So, effectively, the race really got to start from a single-file yellow-flag conga line, not so much from the original three-wide start. Sage Karam didn’t expect Takuma Sato to be in his path to the side, going around on the outside. Karam was next to Ryan Hunter-Reay, which would have made Sato’s nosing-in a three-wide pass along that turn. Ryan Briscoe was caught up in the debris field from the shunt, where he was clipped by James Davison. Sato’s team was able to repair his car and rejoin at the back. Karam wasn’t as lucky and had to retire. He was checked and released from the medical center, thankfully, with no injuries. 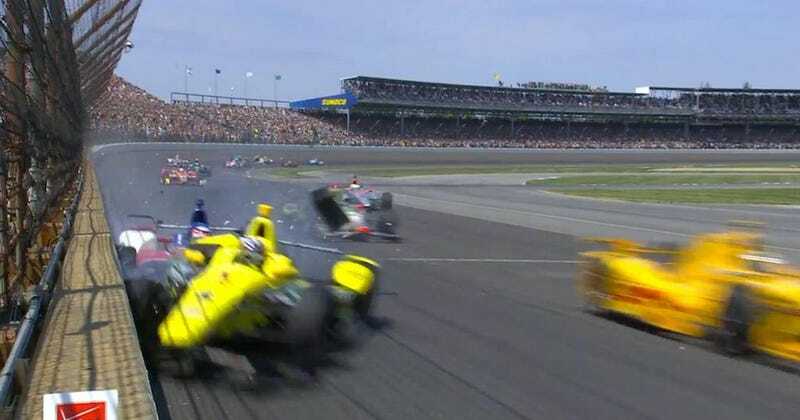 These two wrecks caused a yellow flag, which was extended when Simona de Silvestro ran into Juan Pablo Montoya’s car, damaging his rear wheel guard. The commentators speculated that Silvestro wasn’t paying enough attention and just rear-ended the guy. Either way, this series of avoidable contact drug out the start longer than we wanted, but we got to enjoy over 100 miles of fairly clean laps after that, so it all worked out in the end. Either way, between Karam and Daly’s retirements, that’s two young stars who were taken out disappointingly early. Between the start and a later incident, it’s not been a good day for the younger end of the field. Bryan Clauson later had a race-ending shunt towards the middle of the race where he went too high into turn 4 and ran out into the wall. Fortunately, Clauson’s Chevrolet caught no air, which was a major concern before the race began. Clauson has been checked and released from infield Medical Center with no injuries.